One of my all-time favorite quotes was spotted while I was on a mission trip over twenty years ago. The mission trip was working on the border of Texas and Mexico. We were staying in a very old hotel. In the lobby there was a fancy plaque that, in great detail, described how this hotel was designed by a very famous architect in France. At the bottom of the plaque, in very small letters, it said: “Redesigned on site”. This is how I believe the Holy Spirit tends to work. We come up with a plan, and the Holy Spirit redesigns it at just the right moment! That’s how I felt this last Sunday morning when I was one of the preachers at the one hundred and twenty-fifth anniversary service for the First United Methodist Church of Safford. Schedule wise, this special opportunity came at a bad time for me. I had been out of town for most of the previous two weeks, which resulted in missing the majority of my time off (yes, I understand that this is not good for my personal self-care). On Saturday I helped to lead a training that took up a good part of the day. Although I had been pondering my message for a couple of weeks, late Saturday afternoon I didn’t have anything written down. Anyone else ever been in this position? I worked on my message until midnight, then I went to bed. In order to be on time, I set my alarm clock for five-thirty in the morning. This was one of those occasions where I woke up one minute before the alarm sounded and turned it off. Then I fell back to sleep for another thirty minutes. Although I was satisfied with my efforts, I had been hoping to work a little more on my message before I started my journey to Safford. That didn’t happen! I learned a long time ago that my message is never completed until it is preached. My notes are just a starting point. God has a way of changing the message on-site in live-time. I never know what is going to happen until it happens. This adds to the fun! I’m always watching and waiting to see how I need to respond. Holy Spirit actions can’t be planned, instead they are experienced. On this past Sunday God used a little girl named Mianah. My understanding is that Mianah is use to coming forward for children’s time with the pastor. This Sunday, though, there wasn’t a children’s time in the service. Mianah decided to make her own children’s time while I was preaching. She ran towards me once, then hurried back to her Mom. When she came a second time, I encouraged her to join me. Her Mom came up with her, and I had a few moments to sit on the step and talk to Mianah. It happened that the timing was just right to fit into my sermon. That’s how the Holy Spirit works! This is the kind of stuff that we just can’t plan. I continued to preach while I sat on the step. 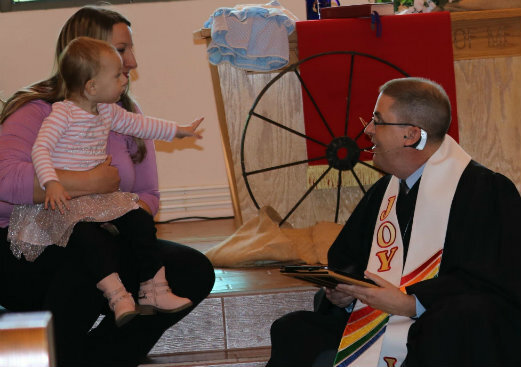 After the service was over, one person told me that the little girl is what made my sermon. I think that they were right! How often do we try to be in complete control of every situation? We are in major trouble if this is our goal! We will never be in complete control of our situations. This doesn’t mean that we shouldn’t make plans, but it does mean that we will never be able to account for all the possibilities of what might happen. From my perspective, it is best to leave room for the Holy Spirit to work. It is easy to call something “bad” that unexpectedly happens, however, this might be the Holy Spirit “redesigning on-site”. This is an anxious time in many people’s lives, along with our country and denomination. We all have opinions of what should happen, and when it ought to happen. Let’s not be so rigid with our plans and expectations that we don’t leave room for the Holy Spirit to work. Our plans might look wonderful (especially on paper), but the Holy Spirit’s re-designs operate at the level of being miraculous!